Cyclemeter turns your iPhone into a powerful GPS stopwatch, giving you feedback and motivation to go farther, become faster, be healthier, and live longer. ? Supports iOS 4 and multitasking! ? Named Best of Show at Macworld 2010 by Beatweek. ? Bike Doctor will show you everything you need to know to keep your bike in perfect working order. Simply choose a part of the bike you want to look at and follow the repair. 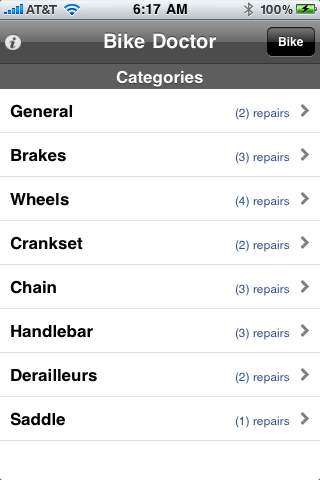 Designed by a cyclist, for cyclists, Bike Gears is the premier Bicycle Gear Calculator for the iPhone/iPod Touch. Calculate Gear Ratios, Gear Inches, Development and Gain Ratios using your bike’s measurements. The app now has over 200 preset tire sizes and also lets you enter your own custom tire size for personalized measurements. That’s Walking, Hiking, Running, Cycling, Sailing, Skiing, Flying, Racing, Geocaching. Live Speed and Altitude graphs. Ascent / Descent and gradient information. Share tracks up to 5MB. Map Storage Interface: Downloading and storing maps is faster and easier than ever. MotionX Terrain and Road maps can be stored for worldwide use and no data fees. High contrast skin style for easy daytime viewing. Support for GPX file import enables wirelessly importing of GPS tracks and waypoints from any source, anywhere. 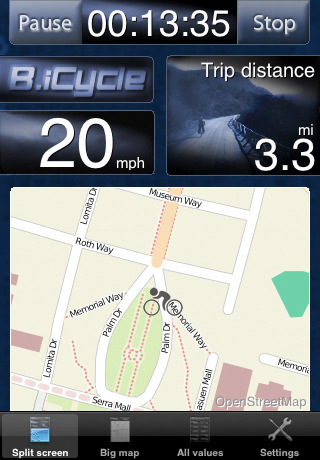 B.iCycle provides all the information you need on the bike. Our stylish user interface combined with maximum ease of use create a new experience on the bike that beats an ordinary bike computer by far! 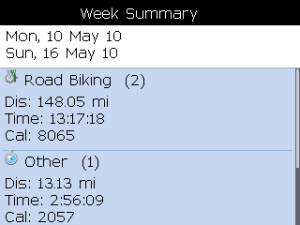 See colorful high resolution charts of your training and riding progress for Weekly, Monthly, Yearly, and All time. 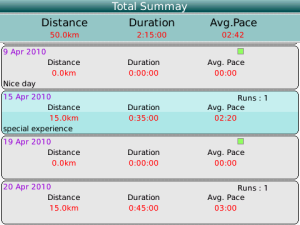 Chart your distance, average speed, and time. Optional automatic tweet (twitter) of each ride after you enter it lets your friends and family follow you on your bike! Export ride data to CSV — private access to last 5 exports via Cychosis exports server. 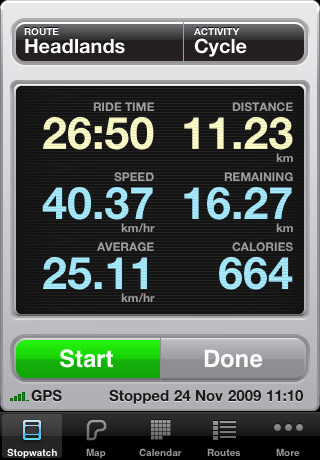 Keeps track of the mileage and number of rides on any number of bikes. Set any number of distance goals and track progress against them. Keeps track of common routes, distance, elevation, notes, etc. Automatically keeps stats for each route. Quickly record rides as soon as you’re finished. Shows stats for each ride. 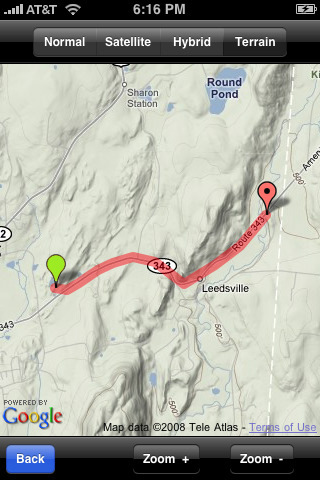 Pre-fill a new ride with one of your pre-defined routes, or enter a new name quickly. Pedal Brain can be thought of as three integrated products. First, it’s an iPod and iPhone ANT+ accessory. Second, it’s a complete training log. Third, it’s a coaching platform. Each of these products have been designed together and as such integrate perfectly well. There’s no distinction between your workouts on the web and your workouts on the iPhone or iPod. Simply go for a ride and all your performance data is uploaded in realtime to the web where coaches, teammates and friends can see it (if you allow them to). There’s no post workout data upload step with Pedal Brain. 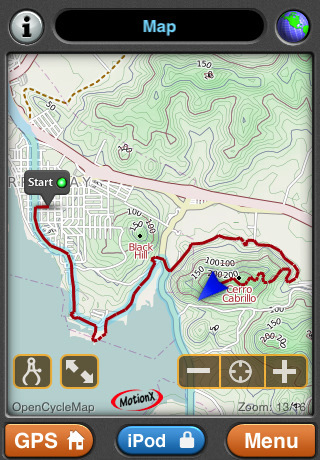 Record maps while hiking, on bike trips or while jogging directly on your iPhone. Easily import tracks and follow hikes of others! EveryTrail is the best way to share trips, connect with other travelers and find great new things to do. Distance Meter ProBy Future Apps Inc. Distance meter is an easy to use, multi-purpose GPS distance tracker. Ever wonder what the distance of your favorite walking trail is? Distance Meter can find it! Need to know how fast your traveling while biking? Distance meter can tell you that too. 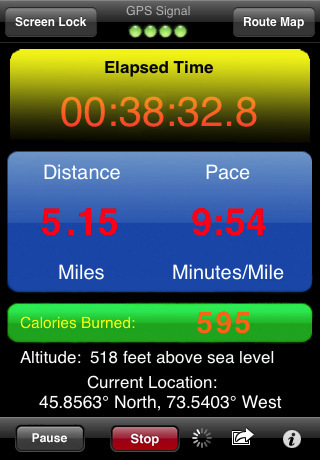 Distance Meter can even show you how many calories you have burned! 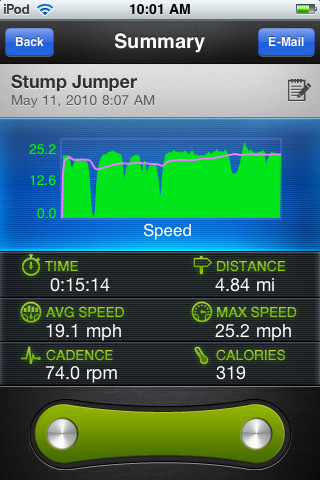 Since Distance Meter takes advantage of the iPhone 3G’s built in GPS Receiver, its accuracy is much improved over a standard step pedometer that cost ten times as much. 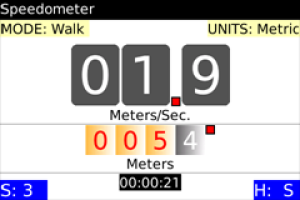 Distance Meter’s calculations can be accurate to within a few feet with a good GPS signal. Go walking, hiking, jogging, running, biking, and distance meter will automatically calculate your distance traveled, current pace or speed, and much more! In addition to being the world’s most beautiful and easy to use cyclocomputer, the bike computer is also a GPS tracking application, which means it records and uploads a track of your bike ride. Our website, www.everytrail.com, helps you visualize and annotate your ride, and to share it with your friends, family, and our fast growing community from over 130 countries. Bike Your Drive by REI is an iPhone app that helps you join the self-propelled revolution by logging your Bike rides with some cool features. 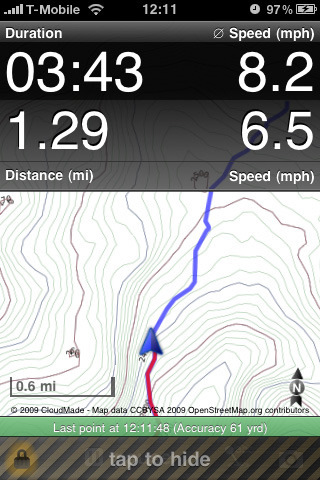 The app keeps a GPS log of your bike rides, whereever you go. 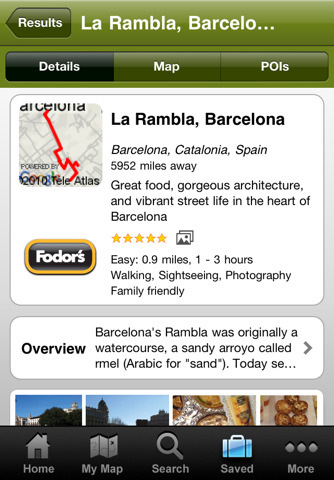 You can also snap photos on your route which are automatically geotagged with the location of the photo. 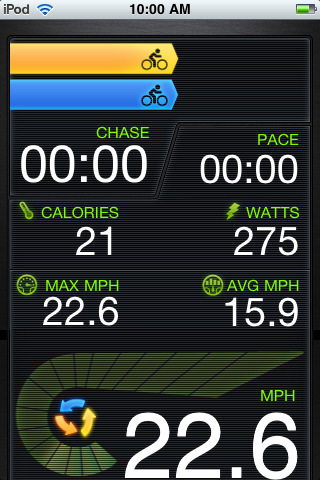 The stats screen of the app shows you a summary of your speed, distance, and time elapsed. 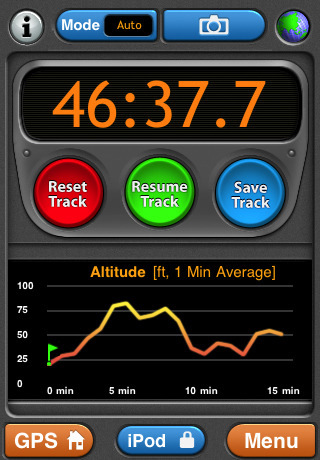 Also you see your average speed, elevation and compass heading along with health and environmental impacts. LiveRider is the first Wireless Cycling Computer and mounting system for iPhone and iPod touch. Incorporating advanced 2.4 GHz wireless technology from New Potato, a single permanently-sealed sensor unit is mounted on the frame near the rear wheel that measures both bike speed and pedal cadence and transmits that information to a receiving unit attached to the 30 pin connector of the iPhone. Captured securely in a sleek and aerodynamic shock-absorbing handlebar mounted cradle that protects against vibration and debris, the rider’s iPhone is immediately accessible, yet can be quickly removed along with the receiver dongle. 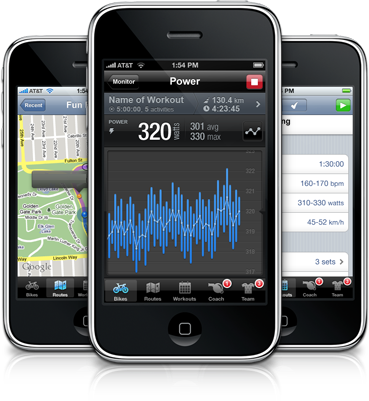 Unlike other cycling computers, LiveRider is able to leverage the advanced features of the iPhone and iPod touch to provide the user a hi-res color touch screen interface, GPS features providing location and tracking, and accelerometer features to record inclination. LiveRider includes a file system to save the detailed data from each ride which can be reviewed graphically or exported via email and imported into any spreadsheet, document, or database. * Helps you to track your workouts & cycling logs on a calendar. * Record your workouts and rest days with this application, and see your history and trends on the visual calendar and summary. * Now, completely record, monitor, track & recall all your workouts for the entire year. * So, now stick to all your goals & achieve them using this application. * Have a quick view of all the data on the calendar itself. * Record all the data along with the basic information like name, photo, etc. * Send the data through Email. * Quick glance of the cycling log data. 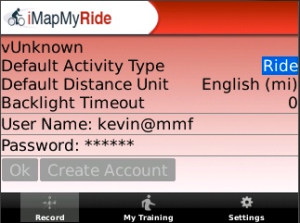 iMapMyRide features real-time ride gps tracking with distance, time, pace, and speed display, support for mile or km output, synchronization with your cycling training log and biking routes on MapMyRide.com, viewing of your cycling history with maps from your BlackBerry® smartphone, and Twitter integration. GPS-location must be enabled and 3rd party access supported by your carrier. For example, this product does not work with Verizon and the Curve/Bold however it does work with Verizon and the Storm. This product also does not work with most international carriers. Please check with your carrier before you purchase this application as we are unable to provide refunds through the App Store. With iMapMyRide, you can instantaneously get your cycling maps and view them in Google or Google Earth, view elevation profiles, post them to your blog or website, email them to friends, or print them out for an event or group ride. When you ride, iMapMyRide.com automatically breaks your rides into 5-mile splits so you can compare segments of your workout. Track runs, bike rides, walks, and fitness workouts with AllSport GPS. Download a FREE 7-day trial version today; just click “Download Trial.” After 7 days, we will ask for a one-time fee of $19.99. * Collect fitness stats (time, speed, distance traveled, and calories burned). * Store weekly, monthly, and annual workouts. Compare workouts online too. 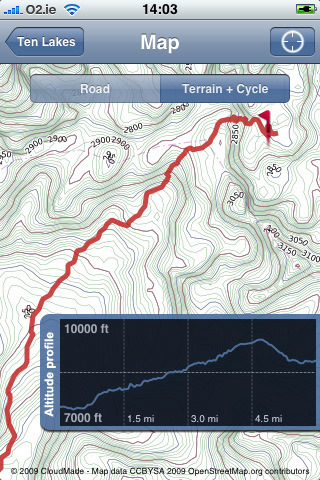 * View speed and elevation graphs. 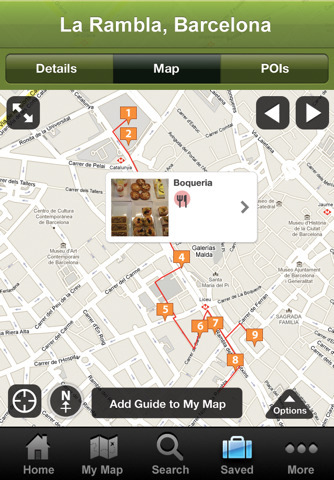 * Download street, aerial, and trail maps wirelessly to your BlackBerry®. 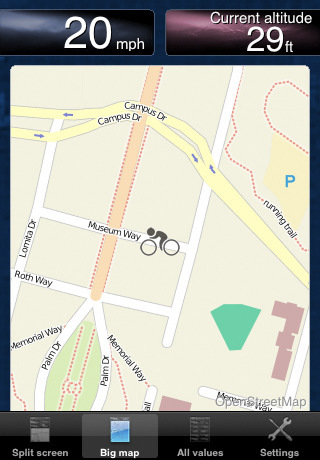 * Send workouts wirelessly to the trimbleoutdoors.com to see more maps and stats. * Share and exchange rides, runs, and runs with friends. * Retrieve trips from your online account on your phone. * Access thousands of public trips submitted by our online community and the editors of Bicycling magazine. * Keep workouts private or share them with our active community. * Race against previous workouts to better your personal records. 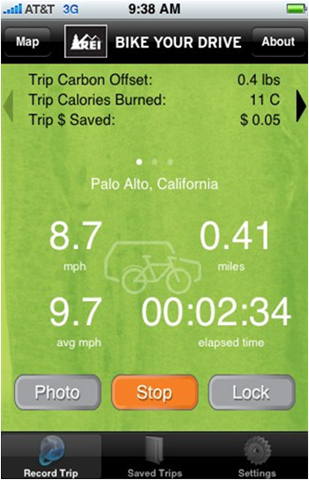 Bike-O-Meter is a “must have” App for every cycling or walking enthusiast. The App works equally well in an vehicle or automobile. Bike-O-Meter is both a speedometer and odometer that allows instantaneous speed and distance whether you are walking, riding a bicycle or a vehicle. 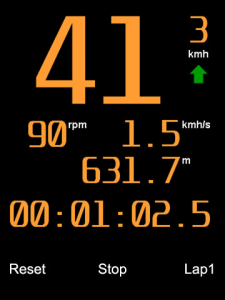 The Bike-O-Meter App employs some very sophisticated algorithms to calculate speeds and distances very accurately. It provides the ability to monitor speed, distance, elapsed time, heading/direction and locations that are important to a serious traveler. 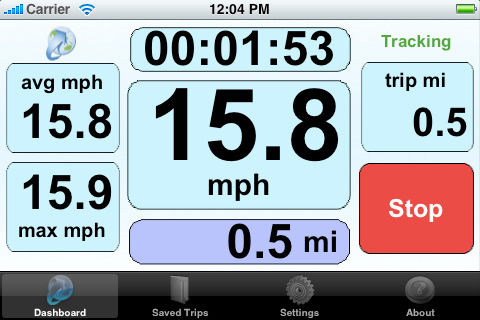 Bike-O-Meter tracks your trip, your overall speed, distance and elapsed time. Mount it on your vehicle or carry it in your pocket/holster. All cellphone functions are available while you Bike-O-Meter runs in the background. Transforms your phone into an advanced cycling computer. Strap it on your thigh and get cadence from accelerometer and speed from GPS. Keep your eyes on the road, not your display with audible VeloTones.